We try our best that our customer can avail a quality range of 2 X 2 Direct Acting Solenoid Valves which are designed precisely and engineered well by using premium quality raw materials sourced from the trusted vendors in the market. These valves are mostly used and known as 2/2 & 3/2 Direct Acting Solenoid Valves. Our Offered Solenoid Valves are well appreciated by our clients for their high performance and durability, corrosion resistance, precise dimension and its finish. Motorized Control Valve Having experience of decades in the industry of Control Valve we provide with the best qiality product of Motorized Control Valve to our esteemed Customers.These Electrical Motorized Control Valveare 2 Way. It is designed using good quality of raw material again sourced from the trusted vendors of the market. It's Quality feature are mentioned below. Features : Normal Closed/Open. Size from 1” to 6”. Power Supply is 230V W. Pressure starts from 10 Bar to 20 Bar. Temperature 180 C, 300 C & 450C. Action Linear & reversable with change of power. Media Steam, Thermic Oil, Water & Chemical. 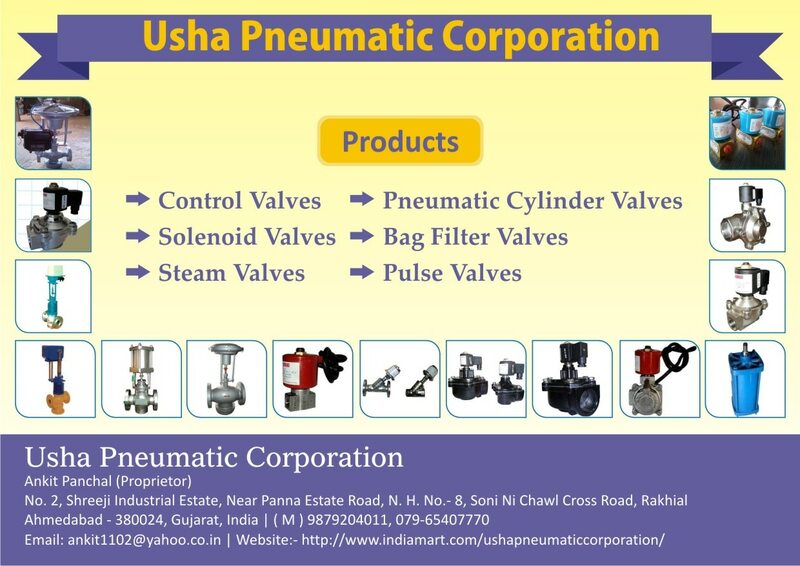 Usha Pneumatic offers a wide range of DIAPHRAGM OPERATED SOLENOID VALVE to meet the basic requirement of the market and provide them with the best solution. These product is also called a Normally Closed of Normally Open which is based on the situation of the valve whether it energized with an electrical field. We always use premium quality of raw material for our all products. More technical specifications are mentioned below. Specification : Actuator is diaphragm type which is internal pilot operated type. Both Normal Close & Normal Open. Size range starts from 1/2” upto 2”. Body is designed with CF 8. Diaphragm is in Neoprene or Viton. Pressure range 0.5 upto 10 Bars. Temperature carries upto 85* C Both Screwed and Flanged End available. Application in Air, Water, Gas & Vacuum.